Father’s Day is coming up. I think it is hard to come up with fun ideas for dads. My husband tends to buy whatever he wants and needs so there are not a lot of things on his wish list. He doesn’t have any more room for pictures or frames at his desk at work. He loves to grill, hunt and be outdoors but, we have already done gifts for most of those areas of interest. Instead, this year I decided to paint a pint glass highlighting when he became a dad. Note: This project takes less than 10 minutes to create, but you will need to allow time for the paint to cure before using or giving as a gift. 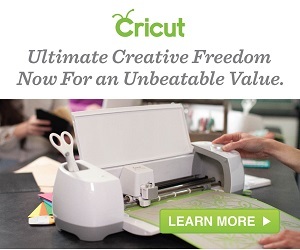 To start with I created a design on Cricut Design Space™. It says Dad and is underlined by a fancy swash. Below that I added EST. 2006 (established 2006) to signify the year he became a dad when our son was born. Note: Open the above file and you will be able to change the date to whatever date your special guy became a dad. Simply double click on the “EST. 2006” text box and change it to your date. Be sure to choose “select all” and then attach before you cut so your design stays in the same position. I then cut out the design using my Cricut Explore. Since we are using the design as a stencil, weed out all the letters. But be sure to save the negative spaces in between the letters, like the middles in the D and the A. Apply transfer tape to your design. Smooth over it with a popsicle stick or scraper tool. Remove the transfer tape from the vinyl backing and carefully apply to your glass. Smooth it on there really well and then remove the transfer tape. Add your glass paint on your glass and spread with a paint brush. Remove the stencil right away. Note: You can use your weeder tool to carefully remove the little inside pieces on each of the letters and numbers. Go slow and be careful. Use a small paint brush to touch up any spots that need it. Cure your design. Allow the painted pint glass to air dry for 21 days. You can speed up the drying process by baking in the oven. Allow your design to air dry for 1 hour. Then place your glass in a cool oven. Bake in a 350° oven for 30 minutes. Turn off the oven and allow the glass to cool. Wait 72 hours before using. Find full instructions for all Martha Stewart glass paints here. 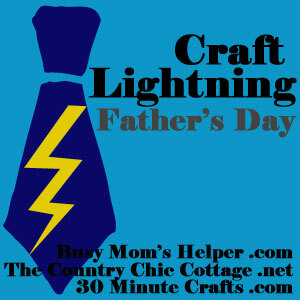 This craft project is part of Craft Lightning: Father’s Day Edition. Bloggers get together to bring you crafts that take 15 minutes or less to make. Be sure to check out the hosts – The Country Chic Cottage, 30 Minute Crafts, and Busy Mom’s Helper – to check out all the great craft projects this week! Love this gift idea! Thanks for joining! Thanks Angie! Thank you for hosting. Have a great weekend.